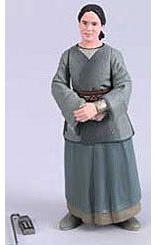 As a girl Shmi was captured by space pirates, seperated from her family, and sold into slavery. Shmi currently serves Watto, a junk dealer on tatooine, and also earns a small income cleaning computer memory devices. Shmi is devoted to her son, Anakin, who possesses special powers. She can always sense when he is nearby.